Each photo is different and needs individual treatment. Tweddo's editing tools are configurable in such a way that you'll never be restricted. In Tweddo you can even override configurations per photo! What is a photo editor without a live previewer? Not very useful... It's not different for a batch application. 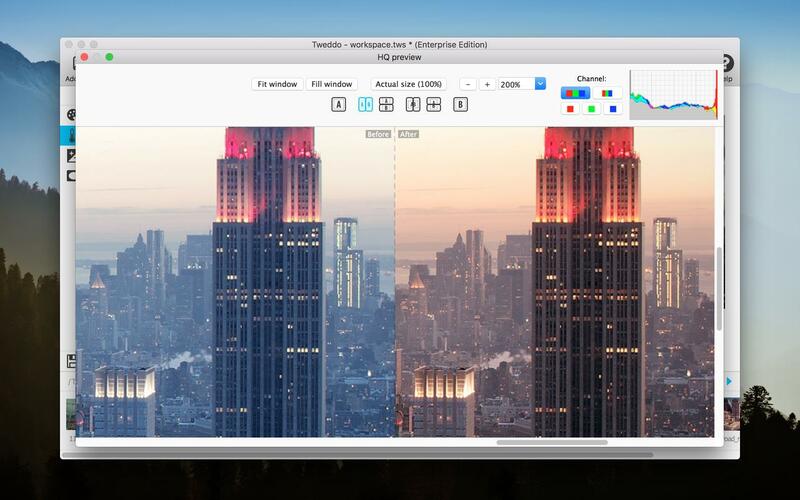 Tweddo enables you to compare the output of your photos before and after mutations in a split view! Performance is key in the development of Tweddo. This results in a fully optimized batch photo editor, being aware of your multi-core processor while running on a super fast editing engine. Tweddo has a lot of processing jobs for you to choose from. You'll probably use more than one to batch edit your photos... In Tweddo you can easily export your job lists and use them again on a later moment! Sometimes you need to process over and over again to a new set of images, e.g. during a scanning process. Tweddo enables you to watch folders for new images and process your job list automatically! Combined with support for outputting multiple image formats, it also makes Tweddo an ideal image file converter. Both novices and professionals use (flatbed) scanners to scan their photo negative and printed photo collections. With Tweddo you can leave the scanning process purely focused on scanning, leaving editing of the images up to a later moment. This not only makes the whole archiving process less time-consuming and easier... It also keeps your scans raw and unedited on your hard disk, which is what an archive is intended to be! 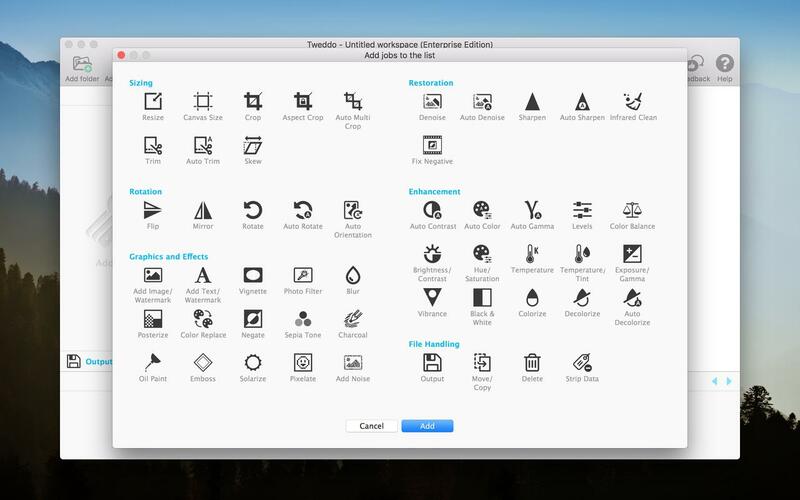 Tweddo offers a collection of image processing jobs to make restoration and enhancement possible in batch mode. Tweddo is the only tool that offers cleaning of the image using the infrared alpha channel of the image. In scanning software this is often referred to as Digital ICE. This means that cleaning spots no longer needs to be applied during the scanning process, but can be applied later on. When dealing with large collections of photos, manual color correction is too much work. With processing jobs as auto color, auto contrast, auto gamma, color correction is in many cases enough to enhance your photos. As part of the restoration processing jobs, Tweddo provides automatic removal of color casts due to photo fading in time, automatic denoising, and automatic sharpening of slightly blurred photos. Automatic trimming of unwanted edges of negative scans through an advanced algorithm. Automatic rotation of photographed and scanned photos. Automatic cropping multiple images from a scanned picture, so you can scan whole negative strips. Still not satisfied with the automatic results? That's no problem at all, as you can use one of the many manual (color) enhancement tools. At the core of the application, sequenced image processing jobs are used to process your collection of photos. Tweddo is not only about photo enhancement tasks... It also is your regular batch photo editor by offering many other processing jobs to serve your needs.